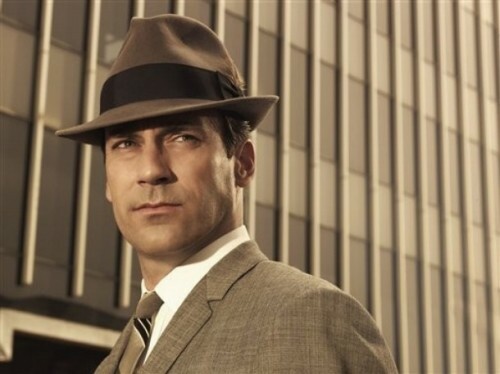 Until tonight, I had begun to despair about Mad Men. Don Draper was now a dutiful – if still selfish – husband and father, having settled into domestic bliss with Megan. No more skirt chasing or cut throat antics at the office. His ex-wife got fat, and boring. Daughter Sally remained spooky. Rodger was still a funny drunk, and Pete was still a cringe-worthy worm. With only a few episodes left, where was all this going? Never fear, cracks are beginning to appear in Don’s milquetoast existence. Desertion (or perceived desertion) – mostly by the women in Don’s life — was the central theme tonight. A deserted, disappointed Don Draper is a dark Don Draper, and we all love Dark Don Draper… preferably with a tumbler of scotch in his hand and a fedora pulled down over one eye. To start, Megan announces she got a call back, and casually informs Don that if she gets the part she’ll be in Boston for 3 months for rehearsals. Don flips out. She doesn’t get the part, but I suspect tonight is not the last time Megan’s Broadway aspirations will threaten domestic tranquility at Chez Draper. Desertion number two: Peggy Olson is leaving Sterling, Cooper, Draper, Pryce. Her contributions were dismissed once too often and she has accepted an offer from a rival firm. Don’s expression when Peggy announces her resignation is full of heartache and confusion, despite the fact that he’d thrown a wad of cash in her face the day before, because she dared complain about Ginsburg getting credit for her work. The writing for this scene is superb. At first Don patronizes and bullies Peggy. “Let’s pretend I’m not responsible for every single good thing that has ever happened to you,” he says, demanding a salary figure that would make her stay. But this time Peggy is in control, and she politely declines. She extends her hand, and instead of shaking it… he kisses it as Peggy cries softly. There’s nothing romantic about that kiss. Don is scared, lonely and devastated. Even more poignant are tonight’s scenes with Joan. Last week, these two old friends slipped out of the office early to test drive a Jaguar, have a few drinks, and cry on each other’s shoulders – all while doing a little harmless flirting. More great writing. Tonight things get darker, as a slimy Jaguar executive makes his approval of hiring of Sterling, Cooper, Draper, Pryce contingent upon a date with Joan – and by “date”, he doesn’t mean dinner and dancing. Pete poses the idea to Joan, and when she doesn’t brain him with her stapler he assumes she’s open to the idea. Is she really willing? It’s hard to tell at first, but once Pete indicates that ALL the partners are supportive of her prostituting herself – but only if SHE really wants to – she quietly goes forward with it, in exchange for a 5% partnership. Joan’s performance is breathtaking. Her poise rarely slips, but when it does you see her profound disappointment because Roger (her former lover), Lane (a supposed friend who urges her to take the partnership instead of cash, so that his financial shenanigans are not discovered) and most of all Don, have so little regard for her. The writing and performances get even better when Don hears of the plan, and rushes to Joan’s house to stop her. He tells her no account is worth the sacrifice she’s considering. She lets him believe that she won’t go forward with the date, but in fact the date is already over and the deed is done. Don only realizes this the following morning, when word arrives that Jaguar is on board, and Joan shows up for her first partners meeting. The looks that pass between Joan and Don at the end of the episode remind me of why I watch Mad Men – how it hooked me and pulled me in from the start. Isn’t it just like the writers, to come up with something this good with only a few episodes left in the season? For me, tonight ranks right up there with season four’s “The Suitcase”. I think Mad Men fans will be talking about it for a long time. What was your favorite scene in tonight’s Mad Men? And why do you think Don couldn’t work with the “Jaguar is like a mistress” pitch at first? He’s certainly had plenty of experience with the topic! I loved this episode and funny you mentioned The Suitcase because I had that one on DVR and have seen it 4-5 times because it’s my favorite episode. I actually teared up when Peggy told Don she was leaving (you can tell me whether that was hormones or if it was a tear-worthy scene). The person that knows Don the best is leaving him, just like when Anna left him in The Suitcase.